When client’s needs are unique, we try our best to accommodate their exact desires. 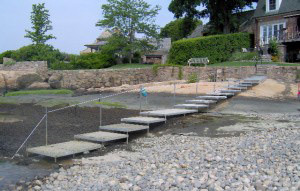 The client’s request was to access the water without slipping or sliding on the rocks. We designed a unique step system which allows easy access to the water at all tide levels. The system also provides minimal impact to the environment, and is an attractive structure as viewed from the home. When you live on the water your house or structure is at the mercy of the elements. 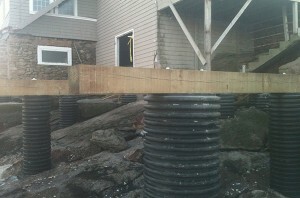 Beebe Dock & Mooring Systems has the knowledge and experience to rebuild the foundation, and shore up the structure. Contact us, when it is required to be built strong enough to withstand the elements, so you can enjoy living at the water’s edge. A simple structure was needed to span this area………the solution, a bridge/walkway. 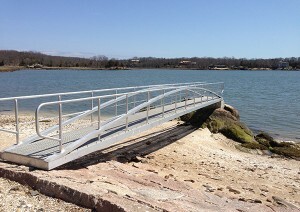 Here Beebe Dock & Mooring Systems provided an arched aluminum bridge, allowing the client to gain access to their dock. In this case the dock extended a good distance out into Long Island Sound. The bridge solution was necessary to cross over an environmentally protected area, and an area that was covered with water most of the time.